It may look like any other top resort in Iraq, but the Ninawa International Hotel in Mosul has one major difference. 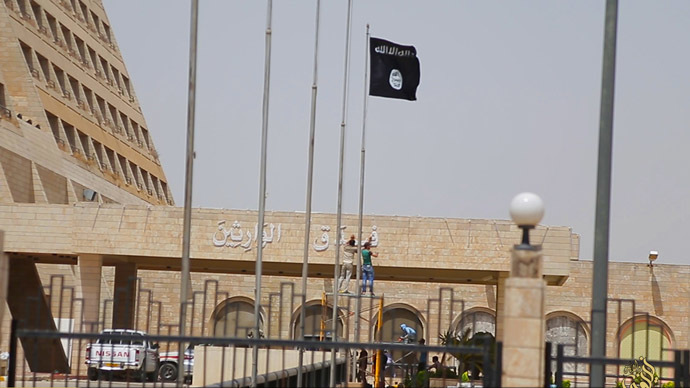 It is the first 5-star hotel for Islamic State jihadists. It includes a swimming pool and tennis court… but no bar. The battlefield is a place of few comforts, so the Islamic State (IS, formerly ISIS) has decided to re-open a luxury hotel in conquered territory to give its jihadists a bit of R&R. The Ninawa International Hotel in Mosul used to be one of the most luxurious in Iraq, catering to foreign guests and local dignitaries. However, its 262 rooms will now be used by extremist terror group. From a distance, it may look like any run-of-the-mill ritzy establishment, but a closer look reveals the terrorist organization’s black and white flags flying in multiple locations around the complex. There is even a swimming pool and tennis courts for hotel guests, while there is also a gymnasium for those wanting to keep in shape. The hotel underwent a facelift ahead of its grand re-opening on May 1. Gone are the building’s decorative pieces of stone work, which have been destroyed by stone masons. Twitter accounts linked to the IS promoted an event to mark the hotel’s opening night. The messages stated that all Muslims were told they could attend free of charge. Men, without their rifles, as well as women dressed in line with the IS’s strict rules, attended the gathering. However, unsurprisingly the hotel’s bar and ballroom have undergone massive changes. Coca Cola has replaced champagne and there’s plenty of water, but no wine. All alcohol is strictly forbidden. The hotel was reviewed by the travel website TripAdvisor before it was taken over by the militants. It listed the Ninawa International as the top hotel in Mosul. One former guest was glowing in praise of the complex, writing in September 2013: "I like it. Its [sic] the one of the best hotels thats I had already visit before. Its actually so comfortable and has a nice view with a large garden and a nice look to the river and in the most beautiful street in Mosul (Al-Ghabat)"
Nader Hashemi, a professor of Middle Eastern Studies at Denver University spoke to RT about the re-opening of the hotel, which he believes is a sign that the IS is here to stay. Given that the hotel is likely to only attract the elite within the IS leadership, due to the cost of renting rooms, which is almost $100, according to the Daily Mail, Hashemi believes the re-opening is nothing more than a gimmick. “I don’t think anyone is going to take this [the hotel] seriously; it is just an exercise in propaganda,” he told RT. The re-opening of the hotel is one of the latest moves by the IS to try and present a view that life is running as normal in the areas under its control in Iraq and Syria. In April, the jihadist group claimed it had created birth certificates for newborn babies. A photograph released on Twitter showed an infant with a gun, grenade and… allegedly the very first Islamic State birth certificate. The authenticity of the photo has not been confirmed by independent sources. Last year, the IS allegedly started producing Islamic State passports for citizens living in territory under its control. In March, the terrorist organization released a tourist-style brochure showing life in Mosul. Images showed crowded market stalls in the city and that the local population was at ease and happy under the rule of IS. Meanwhile, a British jihadist who joined the IS in Syria posted a list of jobs that supporters of the group who did not want to fight could undertake. Abu Saeed Al-Britaini admitted that not wanting to go into battle was a “sign of weak faith,” but said positions such as press officers, fitness instructors and bomb-makers were needed.